Condolence Messages for Mother’s Death: Never make the mistake of picking out a stock greeting card to send condolence messages to express your sympathy. Make it personal and write the words that really describe how you feel. Did your friend’s mom pass away? Tell them how you’re going to be there no matter what. Did someone in the family lose their mother? Tell them that the loss is as much yours as it is theirs. Do all this and more, but do it YOUR WAY. You could ask Google for quotes that express sympathy but that’s just not done. It’s ok to take ideas but in the end, a mother’s death deserves the respect of being original. This whole idea of this post is to invoke feelings that may be hidden deep inside, to help you write a personalized message to help someone grieve. Nothing comes close to the loss of a mother… do your bit to reach out and support in whatever way you can. 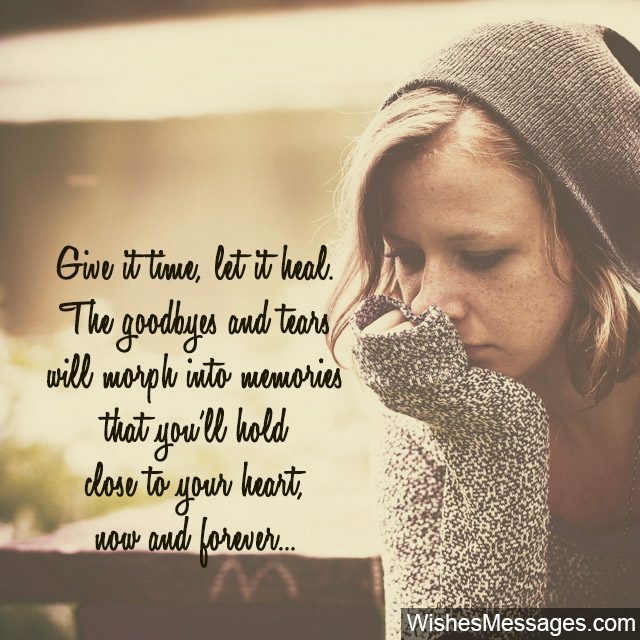 1) Give it time, let it heal… the goodbyes and tears will morph into memories that you’ll hold close to your heart… now and forever. My deepest condolences for your loss. 2) A mother teaches her children to be strong, because she knows they’ll have to face life on their own when she’s gone. It’s a tough time for you but remember your mother’s words every time you feel like you’re breaking apart from within. 3) She gave you much more than a place to call home… she gave you a place in her heart, that you could call your own. I cannot express how sorry I am for your loss. 4) One of life’s biggest ironies is that you will know and understand a lot more about your mother and her love for you… after she’s gone than you did when she was here. 5) Inspirational woman, loving mother and a great human being… these three things explain the deep impact your mom had no just on you but on every life she touched. Our condolences. 6) So warm and caring your mom has been to me, I cannot imagine what a lovely mother she must have been to you. All I can think of right now are the amazing moments I’ve been around with you and your family. My deepest condolences. 7) A mother… the only one who’ll fight battles for you, even when she knows it’s a losing fight. It’s hard to lose that support in life and I deeply feel for your loss. I’m always here for you if you ever need anything. 8) Life will go on, but there will always be a special place in your heart, reserved for the woman who sacrificed it all, just so you could have it all… your mother. I am so sorry for your loss. 9) I cannot put into words what you must be feeling… losing a mother is like losing the only person who always understood even the things you never said out aloud. Life will never be the same again, but it’ll teach you to stand strong even during the toughest storms. 11) I truly hope that our friendship can help you sail through these toughest times in your life. Whatever you need to get back on your feet, I’m here and always will be. 12) Losing someone so special in your life is unthinkable. Be strong and make peace with the past, that’s what your mom would have wanted you to be. 13) Nothing can come close to a hug from her, but every time you miss your mom… always remember that you’ve got a true friend in me, waiting here with arms wide open. My deepest condolences. 14) A mother’s love is unconditional and forever… it’ll nurture you from deep within the soul even when she’s no more. My condolences to you and your family. 15) Death is life’s funny way of showing you how many times your mom was right about so many things, when you thought she was wrong. Use her words to live the best life you can, there is no better tribute to her than that. 16) Your mother lived a simple life but gave her children a great upbringing with great values. Her life was living proof that you don’t need to be rich and famous to do great things. 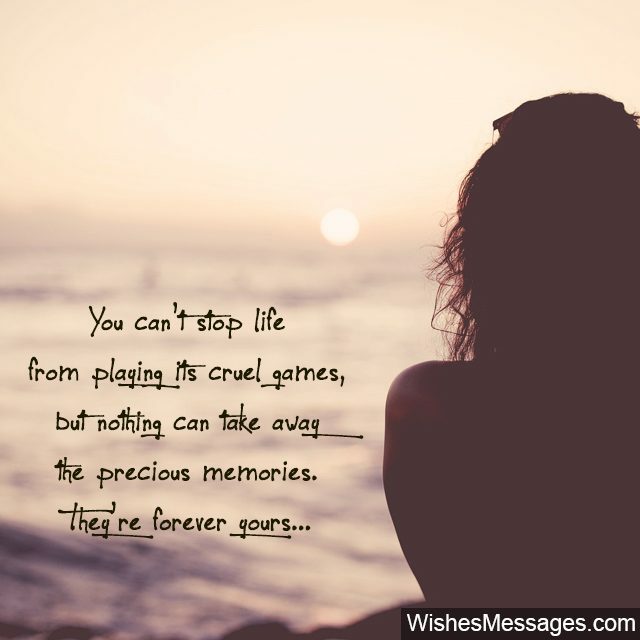 17) Nothing can stop life from playing its cruel games… but nothing can take away the precious memories… they’ll forever be yours. 18) Your mom always taught you to be strong… use it as inspiration every day to make her proud. She might not be around but she’s watching from above. 19) Mothers never die… Even God needs angels by his side. Our condolences for losing your parent. 20) I am so sorry for the grief you and your family are going through right now. Unfortunately, my thoughts and prayers aren’t going to turn back time, but I want to be there for you as a friend… sharing your pain and helping you move on. 21) Nothing I can say will ever be enough to sum up the loss of your mother… all I can say is even God needs angels by his side. 22) I’m lucky to have spent time with your mom. Can’t even imagine how lucky you’ve been to have her as your mother. My thoughts and prayers are with you. 23) We all know that she was a mother per se, but we all know she was the Sun of the family’s universe. 24) As cruel as death is, it is one of the most powerful reminders of the most beautiful memories. This may sound unreal right now but as the days go by and you recover from this unthinkable loss, the amazing moments you spent with your mom will be the memories that convert your frowns into smiles. 25) Your mom sacrificed it all, just to put a smile on your face. 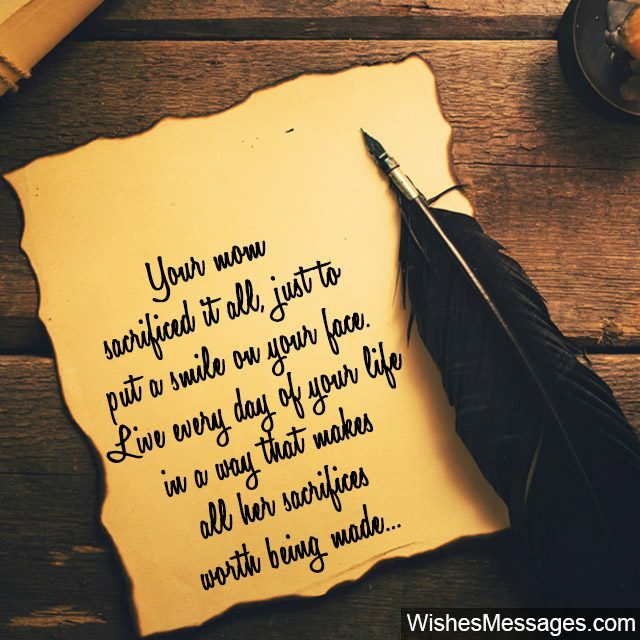 Live every day of your life in a way that makes all her sacrifices worth being made. 26) No matter what people say about what an amazing person your mom was, who better to know it than the person who she fondly called her child. 27) Condolences will keep pouring in, but no one will ever feel the loss as deeply as you have. 28) Mom… she was the one who had your back, when everyone else left. We’ll miss her. 29) I can mourn with you, but I can never ever even imagine of feeling the pain that you must be going through right now. Condolences for the passing away of not just your mother, but a great human being. 30) A condolence message is meaningless because no one will ever be able to understand the pain you’re going through right now… losing your mother, a person who love was truly unconditional. My thoughts are with you. 31) Every time you look up in the sky and see the stars shining through the dark night skies, smile, that’s your mother looking out for you… just like she did even when she was alive. 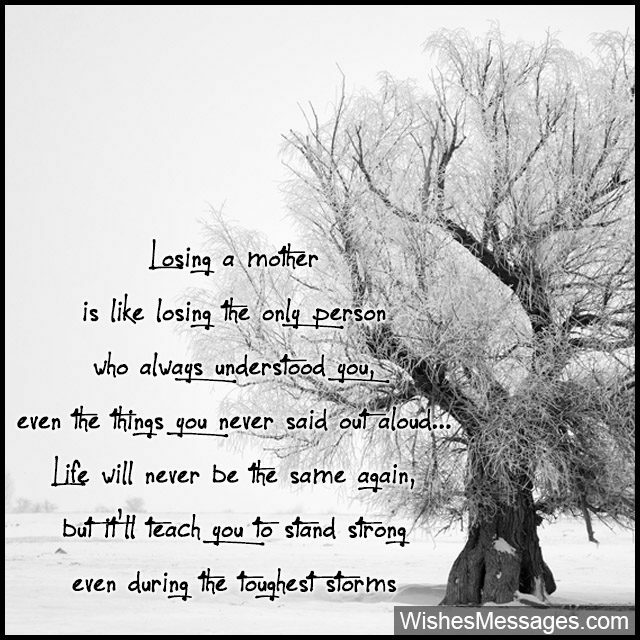 32) You didn’t just lose a mother, you lost a friend who was there for you no matter what. My prayers are with you. 33) I feel too insignificant to tell you how sorry I am for your loss. 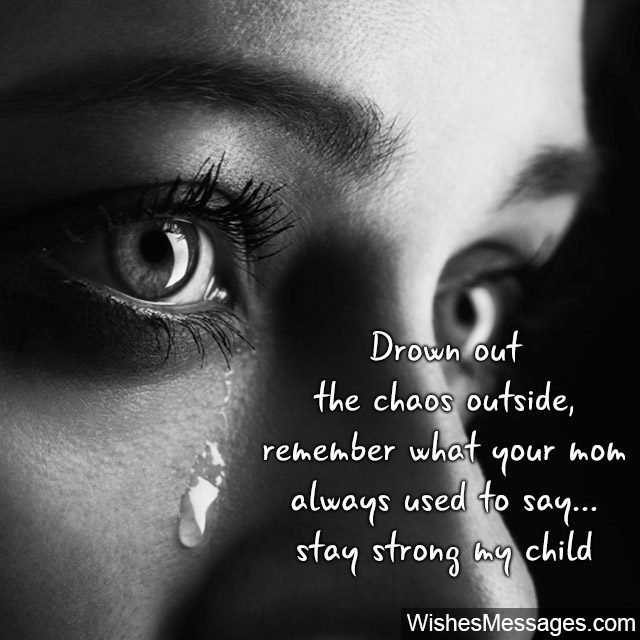 Drown out the chaos outside, and remember what your mom always used to say… stay strong my child. 34) In all relationships there’s give and take… except the one between a mother and her child. A mother gives, and keeps giving all the love that she can, while she can. Our deepest condolences to you at this time and hope that the void of her love can somehow be filled with the beautiful memories that you have shared. 35) You can’t turn back time, but you can make it easier on yourself by knowing that your mom was proud of you… more than anything else in the whole world. 36) One of the greatest things about your mother that I’ve always admired is the fact that she treated everyone like family. It’s a rare quality and you’re lucky to have such a caring soul in your life. She will be missed by one and all. 37) Not just a mother, she was the lifeline of the family. We’ll miss her. 38) An inspirational woman, a true friend and a mother unlike any other… the passing away of your mom has left a void in every life she touched. There is no way to put my sympathy in words, that can express how pained I am. 39) A mother’s love is like magic… so unconditional that it seems unreal. Your mother’s death will rob you of this love, but seek solace in knowing that you were lucky enough to call such a wonderful woman your mom. 40) Life will be incomplete without the woman who put smiles on faces and happiness in every life she touched. Your mother wasn’t just yours… she was an angel to all of us too.